Many mutual fund investors would have walked past glittering shopping malls, massive office complexes and IT parks, never imagining that one day they would get an opportunity to put their money at work in such real estate assets. Enter Real Estate Investment Trusts (REIT’s), which are similar to mutual funds, conceptually. Both are collective investment vehicles which collect money from many investors, pool them, and then invest in assets: mutual funds (MFs) in stocks, bonds and other securities, REIT’s in commercial real estate. Cash flows/rental income from the property are passed through to the REIT investors, in proportion to the number of units held in the underlying scheme. There are significant differences between the two. Investors can put in as little as Rs 5,000 in an MF scheme, while REIT’s require a minimum Rs 2 lakh investment at the time of the initial offering (recently reduced to Rs 50,000), and subsequently are traded in minimum lots Rs 1 lakh. Most mutual funds are open-ended in nature, with investors able to redeem their investment from the mutual fund itself. REIT’s do not have this option, as they are close-ended in nature. The only way to exit is to attempt selling in the stock market, with an uncertain outlook for a liquid secondary market. Neither MFs nor REITs offer guaranteed returns. Debt MF’s generally provide returns ranging from 6.5% to 10.5%, depending on the risk profile. Since REITs are a new instrument, there is no past return history available to gauge their return potential. If the performance of their infrastructure counterparts, the InvITs, are any indication, investors looking for capital gains, could be disappointed. InvITs trade at 15-35% discount to the issue price, though the income distributed to unit holders, is not captured in the secondary market price. Commercial real estate (CRE) is inherently risky in nature. The Basel norms for capital adequacy applicable to banks, stipulate 100% risk weightage for CRE exposure, against a mere 35% for residential mortgages. 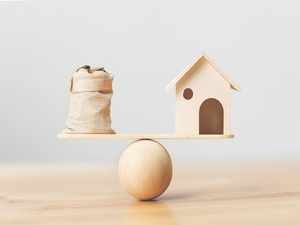 The last few months have seen many news stories of real estate developers being in dire straits on account of unsold inventory and a massive liquidity squeeze on account of their primary lenders, the NBFCs, going through a similar difficult situation. Entry by the retail investor into CRE through REITs could afford an exit option for cash strapped developers, at a price which is not really a fire sale, though this argument does not apply to REITs backed by sponsors with deep pockets. The legal structure of REITs is complex, with ownership of a slew of special purpose vehicles which ultimately hold the real estate property, along with a trustee, a manager and sponsor(s). Despite being in existence for more than two decades, mutual funds, especially debt MFs, are yet to perfect valuation of securities. Valuation of commercial property in the illiquid real estate market, is inherently subjective, unlike the securities market in which mutual funds invest. Potential related party transactions with the sponsor, is another complexifier (thank you Jeff Bezos, for introducing this French word to us!). Mutual funds invest directly in the markets and are not in the business of acquiring their sponsor’s equity interest in the underlying portfolio which however, is one of the primary objectives in setting up a REIT. Related party transactions are deeply ingrained in the REIT structure, with “independent” directors and trustees hopefully being the conscience keepers to ensure that the interest of the sponsors do not override that of the other unit holders. REIT — is it equity, debt, or something else? Markets appear to be uncertain whether to value these instruments as equity or debt. Should an investor consider REITs as an investment avenue? It depends on the risk profile of the investor and the need for diversifying the portfolio beyond equity and fixed income into income producing real estate. Investors stand to receive not only rental income, but potential property appreciation gains, too. But with all the complexities, and being an untested instrument, with higher minimum investment compared to mutual funds, perhaps retail investors can wait for the performance of the units post listing, and then take a more informed call. For those with a risk-taking mentality, it is best to be prepared for a wild ride going by the secondary market performance of their infrastructure cousins. Of course, those investors willing to take the plunge, can take some comfort from “AAA” ratings, if awarded to the REIT’s debt offering (though unrelated to its public issue of units), by our inimitable credit rating agencies, IL&FS and other fiascos notwithstanding.